When I started Aural Innovations in 1998 I was unaware of the global home taper underground that thrived to an impressive extent in the 1980's and 1990's. We're talking pre-internet, pre-email. But I quickly came into contact with some of the key members of the more experimental elements of the scene, all of whom continue to create exciting music and sound-art, and do so with an enthusiasm that to me is truly inspiring. And four of the artists featured in this set - Charles, Bret Hart, Hal McGee and Chris Phinney - are among those that I discovered in Aural Innovations early days and have since heard a LOT of their work over the subsequent years. And one of the really fun and fascinating things about keeping up with these guys is that they're constantly collaborating with all sorts of different artists and creating an incredible variety of music and sounds. 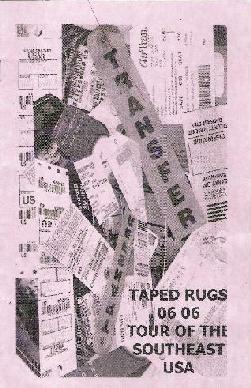 Charles lives in Lawrence, Kansas, has been home recording since the late 1970's, and runs his Taped Rugs Productions label. 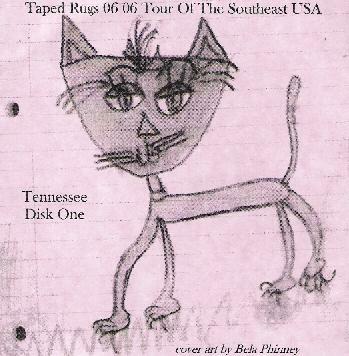 In June 2006, Charles decided to visit several of the artists he had been collaborating with over the years and ended up flying to North Carolina to visit Bret Hart, to Atlanta, Georgia to visit Dave Fuglewicz, drove back to Gainesville, Florida with Hal McGee (who had come to Atlanta), on to Nashville, Tennessee for some music history and touristing, and finally to Memphis to visit Chris "Mental Anguish" Phinney. Hence the "tour", and my own enthusiasm about the thing. It just bowls me over how much these guys have accomplished, collaborating by sending tapes back and forth through the mail. Taken together over the years, the body of work produced by the lot of them is staggering. And I could easily imagine how thrilling it must have been for Charles to actually meet these compadres (Hal is the only one he had previously met) and record in the same physical space for a change. The first stop on Charles' trip was to visit veteran musician, instrument maker, sculptor and educator Bret Hart at his home in Eden, North Carolina. If asked to come up with one word to describe the North Carolina recordings I would have to choose PERCUSSION. If you're a fan of the audio possibilities of hitting things, these recordings are for you. Half of disc one was recorded by Charles and Bret at the Elsewhere Artist Collaborative. "Wiggle Room" is an intense percussion driven piece that takes a noisy crash-bang foundation and delivers it in a smooth rhythmic flow. The clatter continues on "In The Shadow of the Mannequin Foot", but instead of dominating the proceedings the percussives share the stage with Bret's strumming acoustic guitar. "Organic Vacuum Splash" features a steady pulsating electronic drone wave, accompanied by machinery sounds, a keyboard melody and plenty of percussion, though here it's less in-yer-face, instead being more varied, restrained and ultimately more dramatic. And "The Cup That Went Crack" combines Sun Ra flavored keyboards and percussion. Charles speaks volumes about the "instruments" used in a conversation bit when he says, we recorded some sounds on some THINGS. Some were meant to be played as instruments, but most were not. And the way they were played was probably not intended ever. 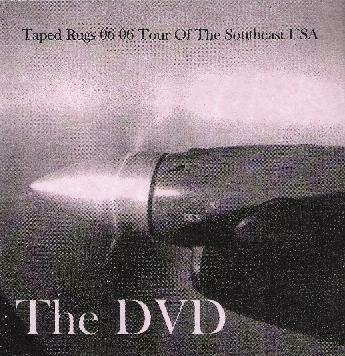 The remainder of disc one features the trio of Charles, Bret and Scotty "Clang Quartet" Irving. Scotty is an excellent drummer/percussionist, having collaborated with Bret on some of his Duets releases, and has had some impressive albums released by the Silber Records label. "It Recorded The Truth" is a 15 minute free-wheeling freakout with Scotty barreling away on the drum kit (DAMN good drumming!) while Charles and Bret run wild producing accompanying space chaos. I love the combination of powerhouse solo drumming and space-noise pandemonium. High intensity and a fascinating assemblage of sounds. I had heard this several times during casual iPod listening at work but really only HEARD it for the first time when I gave it the dedicated review listen. There's just so much happening, and consequently so much to be missed if you're not immersed in it. "Bamboo Curtain" is an often harsh, noise centered piece, propelled along at a steady pace by Scotty's drumming. "A Note From The Voices In My Head" is another heavy noise piece, but with a spaced out psychedelic freakout vibe. "The Cookie Will Show The Way" wraps up the set. It's a 16 minute jam that bursts the mercury for sheer power, intensity and VOLUME! I was practically sweating before this sucker even hit the 5 minute mark. A real acid-noise-avant-garde-mindfuck trip. No brain massage here…. brain DESTRUCTION! But then it goes off into a strange kind of noise-space-jazz jam. Not sure what that flute sounding instrument is, but it sounds really cool jamming along with the manic drumming and noise groove. Like "It Recorded The Truth", this track stands up to multiple attentive listens. In addition to Charles and Bret, the first two tracks on disc two include Ed Shepherd, who records as East October and is a key member of Automatic Music, a collective of improvisational musicians from the region that I've reviewed many times in Aural Innovations. "Onramp to Noah's Ark" (I love that title) continues the cacophonous percussion motif that has characterized Charles' visit to the first in flight state. The rhythmic patterns are nicely quirky, making for a dance number from some avant-garde off Broadway edition of Stomp. And the guys get all kinds of cool sounds out of whatever it is they're bashing on and tossing about. The track leads directly into "The Whole Place Reeks of Haunted", which is very different, being a noise-textural atmospheric piece. Throughout its 13 minute length it really focuses on the details of sound and ambience and the interaction between the sounds, using percussion and electronics. Charles and Bret round out the set as a duo. We've got the brief and relatively laid back "Carbide and Cotton". The quirky "Flight of the Twisted Strings", which is another track with very interesting tonal qualities. And finally the foot stompin' good time "Our Poutage", which is as much a "song" as anything these guys could have produced. I'd love to see them take a whack at putting lyrics on this one. Where's Wild Man Fisher when you need him? From North Carolina it was on to Atlanta, Georgia to visit Dave Fuglewicz at his home in Roswell. I'm not as familiar with Dave's work as I am the rest of this gang, though I've long enjoyed a very cool spaced out collaboration between him and Hal McGee recorded in 2003 called Synergistic Deconstruction. And Hal himself made the trip from Gainesville, Florida so they could record as a trio. Disc One: If you're a fan of the earliest, and more experimental German electronic space music then there's lots here for you to enjoy - think Tangerine Dream's "Ziet" and Klaus Schulze's "Irrlicht". Our cosmic heroes launch themselves deep into avant-garde space with "In The Proximity of the Lap", creating an excursion that blends the glory days of Berlin school Kosmiche with a noise and experimental sound-art aesthetic. Meditative… but unnerving. Dreamy… but at the same time busy, even hectic. "Toxic Sunsets" and "Swan Bumps" are listed as separate tracks but together make for a 40 minute journey into free improv classical music, avant-garde space electronics, atmospherics and an assortment of other fun weirdness. It's like an experimental string quartet doing its screechy high browed compositions along with drones, a variety of bubbling synth patterns, 50's sci-fi flick sound efx fun and the occasional ear splitting shrieks and tones. Forbidden Planet and Plan 9 From Outer Space played by Philip Glass, Klaus Schulze and Leon Theremin, with cameos from Univers Zero. No single mesmerizing theme here folks. It has its subtle moments. But it gets busy busy BUSY! Listen close and you'll be bowled over by the number of elements that make up this parade, and so cooperatively, yet with enough chaos and tension to keep things interesting throughout. "The Little Noise That Tried To Come Out" wraps up disc one and works well as a piece that brings the set to a close. It's got lots of busy percussion patterns mixed with ghostly howling and wailing electronic patterns. Disc two is only a little over 20 minutes but features more spaced out electronic fun. "Unmark of the Beast" is a short track that's like the old Asteroids video game in full battle mode. There's a conversational bit where the guys are at having lunch at the High Museum of Art in Atlanta. And the trip to Georgia comes to an end with the 15 minute "Press To Record Press To Play". This is very different from the other music that the Georgia trip produced. It begins with noise patterns, banging and scratching, flute, and some vocal chanting. I had just watched Indiana Jones and the Temple of Doom a couple nights ago so the chanting immediately conjured up images of caged sacrifices being lowered into a blazing pit. But then the shakers kick in along with the chanting and now I felt transported to Africa circa early Hollywood and the momentary reprieve from the blazing pit transitions to being boiled in oil by cannibals. Then the chants become spoken word poetry, accompanied by some kind of voice samples and a variety of subtle scratching, percussion, horns, human vocal sounds and electronics. An interesting contrast to the rest of the Georgia set. So from Atlanta, Charles and Hal headed back to Hal's home in Gainesville, Florida and the music they created there produced one CD. Hal's own recordings over the past few years have been heavy on piano, and that's what he focused on during Charles' visit. We hear the intense concert pianist style that he's demonstrated on his own works, and at the beginning Charles accompanies on what sounds like violin at one moment, banjo at another…. one or more stringed instruments/devices. Free improvisation that combines some standard classical music elements with avant-garde music and sound production. Hal has a flair for passion and intensity on the piano so we're in symphony mode, though more like the Kronos Quartet dosed on LSD and with piano. There are separate tracks, though they mostly all play as one. As the set progresses, recordings of verbal audio tape fun are added to the mix. The pace and intensity waxes and wanes with Hal's mood on the piano. In an instant he can go from mad concert pianist to considered manipulator of melody and theme. I like the parts where the voice samples sit center stage with the piano, as the contrast makes for the most interesting listening. On "Ecopassage" the aliens have arrived as the electronics finally break their chains and assert themselves. The piano continues but those pesky aliens take over and things get much more spaced out, combining electronic space waves, bleeps and general freakiness, chirping birds and other sundry sounds, and the piano playing merrily away throughout. Fun stuff indeed. The last of the 5 tracks includes Andrew "Ironing" Chadwick, who is local to Hal. This is the most abstract track on the Florida set, featuring a very interesting combination of clatter, voice samples, pianos and electronics. It's amazing how fluid sound-art like this can be in the hands of veterans. You want a freaky lysergic psychedelic experience? This is it! After a 3 day visit to Nashville to tour the country music capital, Charles made the last stop on the tour, visiting Chris Phinney at his home in Memphis, Tennessee. Disc one includes two 23+ minute tracks that consist of the duo exploring deep space electronic realms, with a brief discussion on the southern culinary joys of the pig sandwiched between. "Cusp of 24" is a meditative piece, but has lots more going on than mere floaty ambient drift. There's a leading keyboard melody, accompanied by alien radio wave sounds, atmospheric layers and a freeform jamming stringed instrument (the DVD shows Chris playing acoustic guitar). The track continues to build throughout and has a kind of Frippertronics sounding foundation, but is more spaced out and with more bits added on to make it far more interesting than anything Fripp ever seems to do anymore. "Diagnostician" continues the theme though far deeper in pure electronic space. It's simultaneously dark, droney and haunting, meteor shower speedy and whimsically freaky. Like a creaky door haunted house with flying saucers hovering over the top and a 3-ring circus setup in the yard. I REALLY dig this one. Disc two has 2 tracks of the same length, that play like two parts of a single work. "Cusp of 25" creates a cold dark abandoned alien planet soundtrack atmosphere, though with more avant-garde sound bits than you might expect from your average sci fi flick. What sounds like a stringed instrument starts off somewhat droney sounding but then starts to develop a slight melody that adds a drugged song like quality to the proceedings. Things get busier as the track develops, though at all times retaining an ominous, moody feel. I was listening at night with the headphones on and only the light from my computer monitor and the effect was of a very deep and spooky solitude. "Zippin' Flippin' Dippin' Pippin' Sippin'" picks up right where "Cusp of 25" left off, guiding us further and further into a spacey gloom and doom domain. I suspect most of this is produced by guitars and other stringed instruments rather than electronics. An excellent atmospheric piece, rich in imagery. The CD wraps up with Charles and Chris paying their… ahem… "respects"… at the Elvis wall in front of Graceland. I receive a great deal of space electronic submissions at Aural Innovations. And while nearly all of it is good, and some exceptional, little of it really sets itself apart from the rest. These guys manage to do that because the space electronics are only one element, though often the dominating element, and are accompanied by so much else that the artists succeed at fitting comfortably together. The visual fun starts with a photo slideshow/collage of Charles riding the friendly skies to North Carolina. First stop - Eden, North Carolina, where we see the surrounding landscape (quite beautiful), a performance at the Elsewhere Artists Collaborative and a tour of Bret Hart's sculpture yard. Next it's on to Georgia, where we see Dave Fuglewicz composing on his computer, a Fuglewicz/Goff/McGee performance in Dave's living room (Hal gets most of the camera's attention), and the mucho fun Taming of the Bag video. Next it's down to Chez McGee in Gainesville, FL for some bat house fun and cool image manipulation. Because Charles focused on tourism in Nashville we miss that portion of his trip listening to the CDs. But the DVD nicely documents his visit with shots of the Sun Studios, The Country & Western Hall of Fame, the RCA studios, Ernest Tubb's Record Store and an ooooold time country soundtrack. And then it's the final stop on the tour, where Charles and Chris Phinney cruise Beale Street (the Blues counterpart to Nashville's C&W), and…. AND…. well…. where else do people go when in Memphis??? To GRACELAND of course! Finally we get a live improv jam in Chris' home performance space. Of course there's music and sounds throughout, making this a very nice companion piece to the CDs. Aural Innovations (AI): So you took 10 days to visit and record with various musicians, home recording veterans like yourself. How did the tour come about? Charles Rice Goff III (C.III): Actually it was more like 12 or 13 days. How it came about? Well I had a little bit of money. And I knew I had been wanting to make a trip of this sort for many years. And I felt this was my opportunity to do it. I'd actually thought about doing it last year. Buzzsaw [fellow home taper] had mentioned that he also had wanted to take a little trip. And originally I had wanted to do this on a train, figuring that I could get a pass that would let me go wherever I wanted to for like a month, and that would be perfect. Well of course that didn't work out because, for instance, for me to go from there to Memphis you think you go straight across Missouri to Tennessee, right? Well no, you really have to go to… Chicago first! And in order to get to North Carolina you've got to go to Chicago, and then to Washington, DC, and then have a 15 hour layover in the train station. Anyway, Buzzsaw was going to buy a train pass and he was going to have three destinations he could go to and he wanted one of them to be here in Kansas. And I said from here why don't we go together to at least one place. Because Buzzsaw is a very interesting person, and I'm sure that traveling with him would have been an extremely interesting experience. Anyway, there were some personal problems that took place with his family and he was unable to go on the trip. So I still wanted to do it but I had to figure out what I was going to do and where I was going to go. I kind of figured the southeast United States was a good place to go because a lot of the people I wanted to visit were there. And even though they're spread across a number of different states I thought this was a good chance to explore a part of the country I've never been to as well. So that's sort of how it happened. And of course I had to make arrangements with all these different folks to make sure they were going to be available, and if they were willing to put me up for a couple days, and what days of the week they were available and all that kind of stuff. So there was a lot of planning that took place. Anyway, I planned it all out, and fortunately everything worked out. Everyone treated me very nicely and I had a great time. AI: So even though you had been collaborating with these people for many years, this was a rare opportunity to actually meet and record with them. C.III: Absolutely. The only person I had previously met up with in person is Hal McGee. We played some music at Brian Noring's house in Des Moines, Iowa back in 1997 I believe. And then at Hal's place in Gainesville in 1998 I met up with him there. And another fellow you may have heard of named Phil Klampe came all the way down from Indiana to join us there. So Hal and I have had previous personal interactions. But all the others, no. I mean, Chris I've known for 20 years. But I'd never met him. So like I said, these are things that I've wanted to do for a long time and I finally got the opportunity and didn't want to pass it up. AI: That had to be really exciting to finally get to meet all these people and actually record in the same room together. C.III: Absolutely. Couldn't be better. There is a lot of joy that one can get by collaborating with sound files and tape recordings and things. But when you're actually in the same physical space with another person who has a like mind, playing music with that person, there is a connection that goes beyond the physical that takes place that allows a new experience of sound and creative juices to flow which is not anything like working on your collaboration at home. I've been improvising music with a lot of people for a long time. And all these other guys have been doing the same thing. So it's a wonderful experience to go beyond that just collaborating in your house and actually get in there and share that experience in a live manner. There's nothing like that really. AI: I can imagine. As you say, it's remarkable the things you can do through the mail and email. But having the opportunity to actually be there together... I can imagine how exciting it must be. C.III: Sure, you get to see everybody's different equipment. How they work with the equipment. For instance, at every one of these places there were fascinating devices and musical instruments and noise making things. You saw pictures probably in the video of the walls in Bret Hart's house or instruments on his wall. It's all over his house! 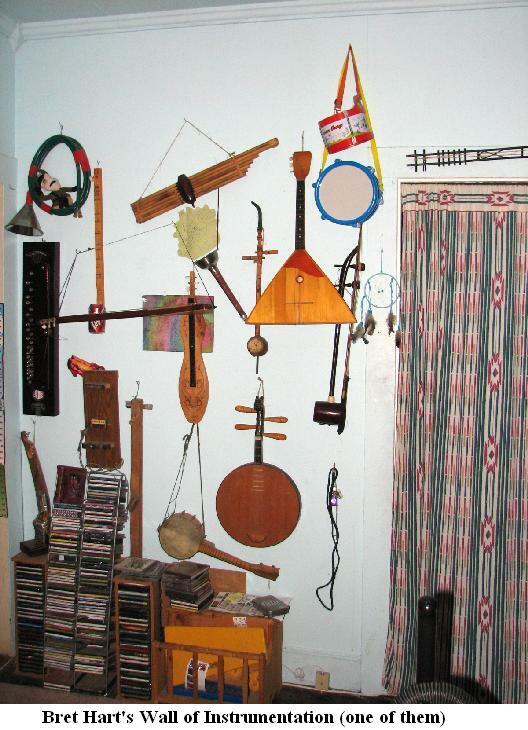 He has instruments hanging on the walls. And they're FULL of instruments! They're all very unique instruments. 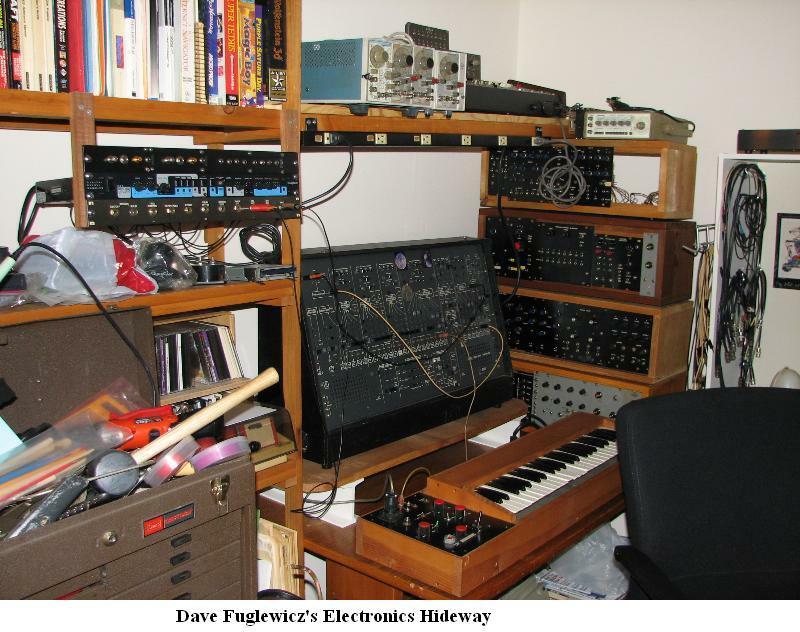 Going to Dave Fuglewicz's house, he has that old patch plug ARP synthesizer. That thing is very large, very old… I believe it took about two hours to warm the thing up before he could actually use it. And at Hal McGee's house he has his wide variety of things. I got to mess around with his kora there. I'd never played one of those before. He had various synthesizers unlike ones I've seen before. His buddy Andrew Chadwick of Ironing came by the night we recorded at his place, and this guy comes with a whole bunch of portable tape recorders, some of them real old Mission Impossible type tape recorders. That's what his instruments were. And that was very interesting. And then at Chris' house he had some real old synthesizers as well as some other things you might have seen in the video… you might have seen me playing that broken guitar that he had. I mean, the body of it is coming apart and the strings are about 5 inches off of the fretboard. And it turned out to be quite an interesting instrument for what we needed it for that night. But that's another thing. You get to see all these different things that people are doing. And of course that can only help to influence me to work on my own instruments as well. AI: So you started at Bret Hart's in North Carolina. You mentioned his instruments and I have seen many pictures that he's shared of these instruments. But I've also seen some pictures of his sculpture yard, which you highlighted on the DVD. C.III: He's got a very large yard, and there are a lot of interesting things out there. And again, you may have noticed that we recorded at that Elsewhere Artists Collaborative. 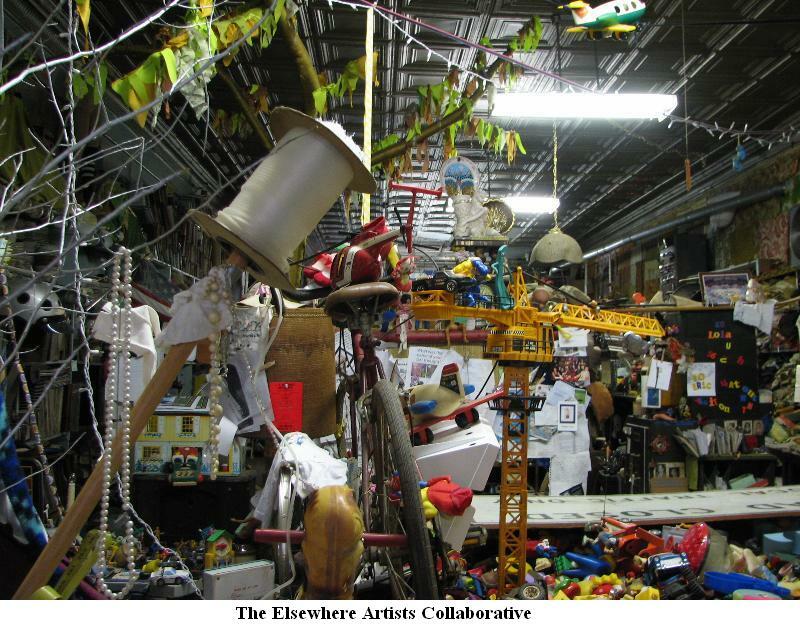 The thrift store that's been converted into an artists collaborative. That was very fun. And the artists were in there working while we were there. So that was also kind of nice. That was sort of an audience. They weren't really watching us, but they were all present. You could sense them being there and having to experience what we were doing. AI: That's interesting. In the video you look like you're alone but I was going to ask if that was actually a live performance Bret had arranged. C.III: I believe that a couple of years ago Bret helped to take apart the piano that's up against the wall there. And there was a performance that he worked on a couple of years ago. And what was happening was it was raining this one day, and he had originally planned that we were going to go out to this calcium carbide factory, to where we did go the next day, to bang around on a bunch of abandoned industrial equipment. But because it was raining he was telling me about this artists collaborative. And I said why don't we go there. So he made a call to the guy that was the proprietor of the place, and he said yeah, come on over. So that's how it was arranged. And we were very lucky that they were so nice to allow us to do that. And then one of the people at the collaborative gave us a nice tour of the whole thing. The place is rather large. And there's people living inside of it as well. AI: The North Carolina CDs had some great music on them. Lots of really powerful and dramatic percussion activity. "Wiggle Room" was a standout for me. And I loved "The Cookie Will Show the Way". 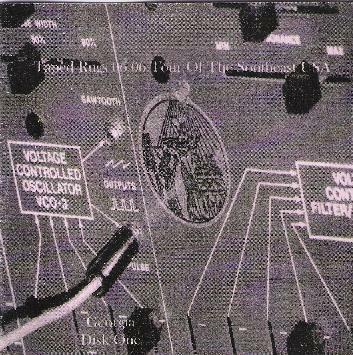 C.III: Well as I pointed out in the book, and as you may have sensed from reading some of the material, whatever happened during the recording process, what was recorded was a very good representation of the interactions that we had, but didn't quite capture the sound as we recorded it. It was kind of a distorted version of what we did. And so when I got back here after the trip I reworked some of that stuff so that I was happy to listen to it more. And Bret's been pleased with how it came out. And the first stuff that Scotty Irving of Clang Quartet did the drums on later, that was so different from what we had originally done. We listened to it back and we were looking at one another like... what is this?? And Bret suggested that we bring the disc to Scotty to ask him if he would do drums on it. And this is the first thing we recorded, so it was before even a concept of what this whole tour package was going to be like. And Scotty was nice enough to say yes. AI: You also had Ed Shepherd involved. I know him from the Automatic Music albums. C.III: Ed was invited over by Bret one night. He came over and brought these big quart bowls with him. And they're basically very resonant. And he had these specialized… I wouldn't call them drumsticks… but something to hit them with and caress them with shall we say, to make them sound interesting, and they did. Ed unfortunately fell ill during the course of our interactions that evening. So we did record some music with him, but I think we could have actually recorded more and it might have been a lot different sounding maybe if he had felt different that night. But yes, Ed was there and it was very nice to meet him. And I've had a nice trade with him since then and got some CDs of his. AI: So did you fly to North Carolina and then cover the trip in a rental car? C.III: No, it was a 9 plane flight. I flew to North Carolina. And I flew from there to Atlanta. And Hal drove up from Gainesville. So Hal picked me up at the airport, and we drove through town to get to Roswell where Dave lives. And from there Hal and I drove back to Gainesville. From Gainesville I took a series of very small planes to eventually get myself to Nashville. And then from Nashville to Memphis I took the Greyhound. And from Memphis I flew back home. But a lot of these flights, because I went for the least expensive, you'd be diverted here, there and everywhere. So I was on like 9 different airplanes. AI: On the DVD there's a black & white segment where it's you, Hal and Dave… is the instrument I see him playing the device you said took a couple hours to warm up? C.III: Yeah, I think it was an ARP 2600. You can see Dave in that video… the only one you can see much of is Hal, and the rest is my hands and Dave's hands. Obviously there was noone there to film it for us. AI: So you drove back to Gainesville with Hal. I had not heard of Andrew Chadwick before, but since hearing these recordings I've discovered like 2 or 3 different Myspace pages he has. C.III: I didn't really know much about him. I guess he had heard of me. And before that day I guess he had played with Hal one time when they had a jam at his house. And I guess Hal had told him I was coming so he came by. And before we did anything… you saw that bit about the bat house on the video? We drove out to see the bats. And then we came back and did the final bit of recording on the CD that comes from Gainesville. Andrew is the guy that's been working with Hal to help him get these gigs that Hal has played. He's played something like three live shows down there in Florida. Andrew apparently plays all the time. I actually got a DVD the other day that has those performances on it and was rather pleasant watching Hal in action before the audience. AI: I liked the diversity between the Roswell and Gainesville CDs. I had heard a CD that Hal and Dave had collaborated on some years ago, with the avant-garde space electronics, and the Roswell recordings reminded me of that. And then the Gainesville recordings featured Hal doing some of the mad pianist that I've heard on some of his recordings from recent years. C.III: Yes, you might even call it a slight avant-garde jazz feel to it a little bit. Because we've played together so many times I think he just decided, well, here's something I haven't played before with you. My point of view is that each of the CDs really is very distinctive as far as how it sounds from the others. AI: When you were in Nashville you were touristing rather than recording, right? C.III: Yes. I have a friend there, we used to work together and we used to actually live right next door to one another for many years when I lived in Oakland, California. And he moved to Nashville a few years ago and I hadn't seen him in a while and he kept telling me to come down to Nashville. So I thought, I'm going to be in Tennessee, this is the perfect time. What was interesting is that… let's say this… I've always sort of had a feeling for country & western music. But I've not really tried to play any of it before, or felt a real strong kinship to it. Well, being in Nashville for a few days, and in the south in general, I think I aimed to be understanding of why, and what, country music is. People's lives seem to very much reflect the songs that are written by country & western artists. And… I don't know… I think the light has gone on and now I understand what country music is, and why it is, and I have a much deeper appreciation for it. When I went from Nashville to Memphis on a Greyhound bus, the guy who ended up sitting next to me was basically a Tennessee hillbilly who was like a truck driver guy. And he told me some incredible stories. I mean, just the best person that I could have to sit next to me on the bus. And he wanted to talk. He was very much interested in sharing his life story with me. And I enjoyed the heck out of it. It's also interesting… you may be aware that I'm a big fan of the Oakland Athletics baseball team. Well it turns out that this guy, even though he's a native of Tennessee, and most of his life lived in Tennessee, was a big fan of the Oakland A's. So what could be better than that? We had some great conversations. Apparently the guy had actually tried out for the Cincinnati Reds back in 1970. Anyway, I think I've come to understand what country music is about. And as a result, I've actually written a couple of country & western songs since I've been back. And I do plan at some point to release these. And hopefully I'll write some more. When I first came back I had a real inspiration. Now I think I'm going to have to work a little bit to get that same feeling that I had when I returned from the trip. But nevertheless, I'm interested in the genre now, and I went out and bought a whole bunch of country western records. I'm a big fan of Jimmy Rogers now. And when I was in Eden with Bret he took me out to the Charlie Poole gravesite where Charlie Poole and the North Carolina Ramblers are buried. Charlie Poole was this guy who wrote the primordial county & western hillbilly music, and had a record deal back in the 1920s. And I didn't know anything about him. But after Bret took me out to the gravesite and told me that he was like the unofficial caretaker of this gravesite, I got kind of interested and I have now since then acquired some Charlie Poole recordings. And I've especially found that I'm interested in the real old 1920s country & western, when it was first starting to be released to the general public on records. So in that sense the whole trip, and especially going to the Nashville country & western hall of fame, and going to the Ernest Tubb record store… just to give you an idea… there was an afternoon in Nashville… my friend had to work a lot when I was there. So he would take me to downtown Nashville, drop me off and tell me places to go and I'd go on my own. And one day I was walking down Broadway, which is the main street in Nashville. It was a Thursday afternoon. It was hot as all hell, it was like a 100 degrees outside. There were several country & western bars on Broadway. At 1:30 in the afternoon on a hot day, all the doors of these places were open, and in every one of them was either a singer with a guitar or a full blown country & western band playing live. I have been to a lot of cities where there's a lot of music, but never seen nuthin like this. AI: You had some pretty neat pictures on the DVD of the Ernest Tubb record store. C.III: Yeah, that was great. I loved that place. And the people in Nashville were very nice too. One example… I was in the country & western hall of fame and I wanted to get something to eat at the little snack bar. Well, they had sandwiches in the refrigerator but it was all meat. I'm a vegetarian. So I asked them if they had anything for a vegetarian. And the women there was just super nice. What she did was, they had all these little prepared boxes of food. She took all the little salads out of them and she gave them to me. I didn't even have to pay for this stuff. And she was more than happy to do this and completely understood my needs. You know, this kind of thing doesn't happen normally in any other town I've been in. So, people in Nashville… super nice. AI: So then you went on to Memphis. And if I've got my geography right, Memphis and Nashville are on polar opposites of the state, right? C.III: Nashville is in the middle and Memphis is on the west end by the Mississippi River. But yes, that was the next destination. And one thing was the bus driver for the Greyhound, he tells us before we're about to start to make sure we're on the bus 15 minutes before we leave. And then the guy decides he's going to talk with his friends and smoke cigarettes for an HOUR before we left. And I'll tell you there were some people on the bus who were mighty upset about this. But the bus driver did not care one single bit. So we were late getting into Memphis. Fortunately Chris I guess called the bus company and they told him they were going to be late, so he wasn't waiting too long for me. But not only did we record some great music at Chris' house, but he was very good with the tour guide job. And Chris is from Memphis, so he has a completely different point of view of things than people who would be a tour guide. He doesn't like Elvis one bit. But he took me all over town. We went to Beale Street, Stax Records, Sun Records, and just was outstandingly the best kind of host you could have. And his kids were really nice too. AI: I assume this was one of his kids that did the cover to disc one? C.III: That's Bela. That's his little girl. She drew that picture while I was there. And I asked her, can I use this for one of our CD covers. Bret's children were also quite nice as well - Linzae and Emily. 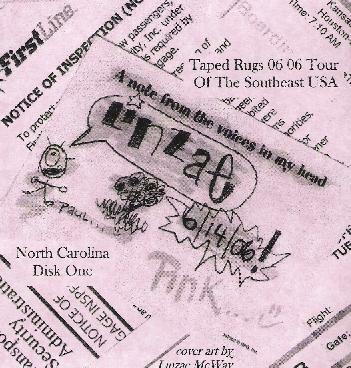 And Linzae is the one who did the cover for the North Carolina disc one. AI: It sounds like you had a real all around musical experience in Tennessee. Between the Nashville experience, touring around Memphis and then getting to play with Chris. C.III: Oh yes, Tennessee was wonderful. You've noticed that these recordings are all different. And you saw in the video that Chris has this small space, this kind of back work room storage place that he does his musical projects in. There wasn't a lot of room to move around in there. But he had a number of different things in there that we messed around with. And all the tracks from the Tennessee recordings were double tracked. So we would record 20 minutes or whatever, and then we would play that back and record over that. And Chris did all the mixing for that. AI: I really enjoyed the DVD. I think you did a really good job of making a documentary out of it. C.III: Well good. That's kind of what I was hoping for. I think I took about 1300 photographs. Plus the little video bits that I recorded. All the video bits of course I overdubbed sounds over them later to make them more interesting. Except for the ones that were live. Like at the Elsewhere Gallery, and at Dave's house, and the one in Chris' back room. That was the magnum opus, because that was the last night I was there, and I had a chunk of gigabytes and figured I'd let it run until it stops. So that's why that piece is like 20 minutes long. AI: But yeah, the DVD had a nice mixture of the photo collages and live performances. And then the music videos if you will, like The Taming of the Bag. C.III: The Taming of the Bag. I really like that one. AI: And then you had the bat house bit. It was funny seeing the bat house thing because before viewing the DVD I read the page in your program guide where you list the different places you had recorded in and I was like, what the heck?? You mentioned the calcium carbide factory a couple times. And then you refer to an abandoned cotton mill. C.III: We recorded at the calcium carbide and abandoned cotton mill on the same day. I recall walking through some dicey areas when we were doing these recordings. But it was worth it. Bret brought a whole bunch of drum sticks and things to scrape with. And of course we found things on the way that we used too. And we really didn't have anybody looking at us. There was nobody around to say, hey, what are you doing? AI: Well this is a fun package of music Charles. And the DVD rounds things out nicely. Thanks! 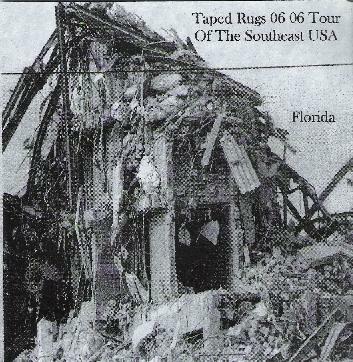 Visit Charles Rice Goff III's Tape Rug Productions web site at: http://www.geocities.com/padukem. Visit Bret Hart's Podcast site at: http://www.edge-surfing.podomatic.com. Visit Dave Fuglewicz's web site at: http://www.davefuglewicz.com. 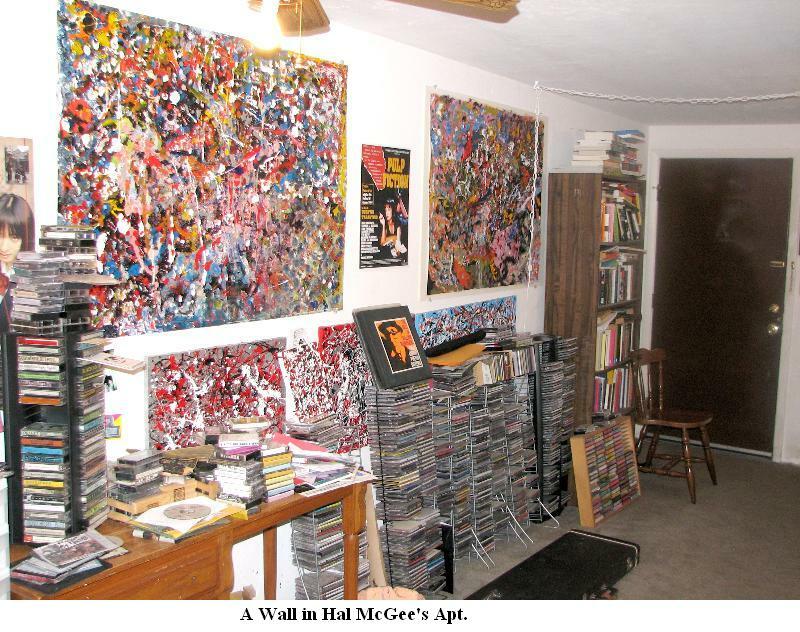 Visit Hal McGee's web site at: http://www.halmcgee.com. Visit Chris Phinney's web site at: http://www.harshrealitymusic.com.